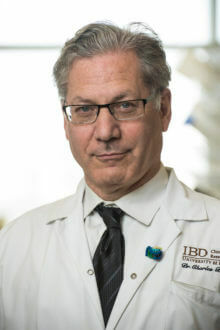 Dr. Charles Bernstein graduated from the University of Manitoba Faculty of Medicine (1985), and the UCLA Division of Gastroenterology Fellowship Training Program (1989). He is Bingham Chair in Gastroenterology Research and Director, University of Manitoba Inflammatory Bowel Disease Clinical and Research Centre. He was Head, Section of Gastroenterology from 2001-2017. He co-initiated the University of Manitoba Gastroenterology Fellowship Program in 1995 and was the Program Director from 2003-2008. Dr Bernstein has published 408 peer-reviewed articles, 29 book chapters and is a co-editor of one of the seminal gastrointestinal clinical-pathology textbooks (Lewin, Weinstein and Riddell’s Gastrointestinal Pathology and its Clinical Implications). As of March 2017 his H index is 74 and his work has been cited 22846 times. He has been elected into the Canadian Academy of Health Sciences (2008) and Royal Society of Canada -Life Sciences Division of the Academy of Science (2012). In 2010 he was awarded the Canadian Association of Gastroenterology Visiting Professor Award. In 2012 he was awarded the Canadian Association of Gastroenterology Research Excellence Award. In 2014, he was named as Distinguished Professor at the University of Manitoba. It is the highest honor the University can bestow upon a professor. In 2016 he was named as the recipient of the Dr. John M. Bowman Memorial Winnipeg Rh Institute Foundation Award, recognizing outstanding research accomplishments by a senior University of Manitoba faculty.